The "Building Code Requirements for Structural Concrete" ("Code") provides minimum requirements for the materials, design, and detailing of structural concrete buildings and, where applicable, nonbuilding structures. This Code addresses structural systems, members, and connections, including cast-in-place, precast, plain, nonprestressed, prestressed, and composite construction. Among the subjects covered are: design and construction for strength, serviceability, and durability; load combinations, load factors, and strength reduction factors; structural analysis methods; deflection limits; mechanical and adhesive anchoring to concrete; development and splicing of reinforcement; construction document information; field inspection and testing; and methods to evaluate the strength of existing structures. 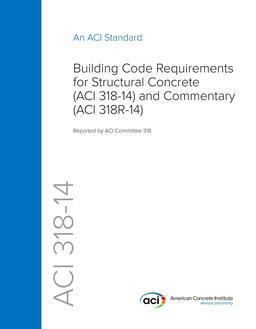 "Building Code Requirements for Concrete Thin Shells" (ACI 318.2) is adopted by reference in this Code.The Code user will find that ACI 318-14 has been substantially reorganized and reformatted from previous editions. The principal objectives of this reorganization are to present all design and detailing requirements for structural systems or for individual members in chapters devoted to those individual subjects, and to arrange the chapters in a manner that generally follows the process and chronology of design and construction. Information and procedures that are common to the design of members are located in utility chapters.